On the occasion of the exhibition 50 Prints & Paintings, Toko Shinoda at 100 at the Portland Japanese Garden (through March 17, 2013), Amy Bernstein interviews Norman Tolman, collector and art dealer, about painter Toko Shinoda. Bernstein writes: "The white space in Toko Shinoda's prints and paintings is a mark whose character is defined by the other marks in the composition. Her elegant marks stretch and pop with the power of the elegant nothing surrounding them. Their very existence is defined by the nothing; they become significant characters, personalities even, as they sit, confronted and foiled by the expanse of white. In essence, each mark is made portrait by this empty space, situating each form's function, and relaying the nature of their meaning. 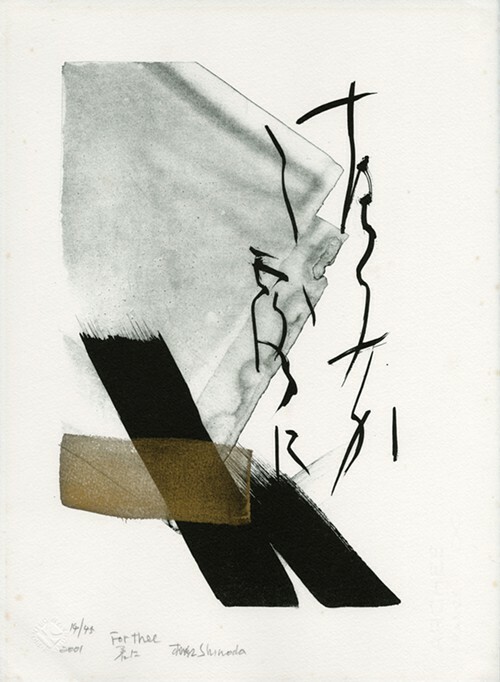 Shinoda's work inculcates her study of calligraphy and poetry into prints and paintings of astonishing force and grace. Her work was influenced heavily by the American Abstract Expressionist movement of the fifties and sixties. Her exhibition, '50 Prints and Paintings' at the Japanese Gardens this month is a visible nod to the metaphysics of form and the relevance of beauty. In our interview, Norman Tolman relayed to me that the Japanese word for art is 'beauty.' Within the realm of beauty, subversion seems even more subversive, as beauty is often passed by and dismissed as vapid in a postmodern world. Shinoda, however, waves its flag with a smirk of knowing and a longer working history than any movement can boast. She is an anomaly of the constant and holds court with artists such as Lee Ufan and Cy Twombly, whose oeuvres not only exemplify yohaku and deconstructionist ideas of ecriture, but discuss the perception of time and the notions of visual story-telling as well."